Permission to engage only in the simplest, rough work, which is paid the least all, this is another sign of segregation. Segregationists believe that certain social groups are simply unable to do some work, more difficult than picking up, cleaning or carrying load. That is, they can perform only simple physical job that does not require any mental exertion. Without a complete education the person, of course, is unlikely to master the professions associated with mental activity. However, the cause is different. Ukrainian society is simply not ready to see Roma in the common occupations. For example, we do not meet Roma, working as waiters, cooks or shop assistants, although they could learn these professions within a few years in the vocational schools. But, because of the negative attitude of society to the Roma, it simply makes no sense for them to acquire these professions – they know they will still not find work, no matter how good they become at these professions. The owner of a cafe will not accept Roma as a waiter because of the fear to lose customers. Incidentally, the police willingly use the same stereotype. For any law enforcement, a Roma is automatically a criminal. And yet – a convenient way to accuse somebody of a crime and to close the case, even if there is no evidence that the crime was committed by the representative of the Roma minority. Similar cases of human rights violation were recorded by the human rights activists lots of times, but more such stories are likely to be unknown. In fact, there is the long practice of “making over” crimes on the marginalized community members in the former police. That’s just the case, when the whole national minority suits this definition. So again we are faced with unequal treatment of citizens by the police on the basis of their skin color. So is it possible, on the basis of the above situations, to talk about the segregation of Roma in Ukraine? To better imagine the segregation policy, it is better to learn from the experience of apartheid in South Africa. In this country they managed to defeat apartheid relatively recently – only in 1994. Until that moment, apartheid in South Africa was the official state policy and was supported by the law. According to it, the population was actually divided into two classes: the Bantu dark-skinned people and white people (descendants of the European colonists). According to the law, all the Bantu population had to live in reservations “Bantu states”, placed on the 30% of the country territory. The dark-skinned Africans were forbidden to live, work or go to the white areas, unless they had a special pass, which was called “the stupid pass.” The pass could be received only by the people who found a job. However, they were not allowed to carry their families to the white area. The accommodation in the Bantu states was extremely bad. Usually there was no running water, no electricity. Hospitals and “aid” service were segregated, and, the hospitals for dark-skinned Africans chronically lacked funds and staff. In many areas for Bantu people there were no hospitals at all. Regarding education, the state spending for one dark-skinned child was 10 times smaller than for the white one. In addition, Bantu Education Act directly stated that dark-skinned children should be taught only basic skills needed to work for white people. Higher education was also divided according to the skin color. White attended the best and most prestigious universities in the country. Of 170,000 students in 1975, there were only 9,000 dark-skinned. Segregation was also in buses and on the railways: buses stopped at different bus stops, and in trains the dark-skinned Africans were allowed only to the third class. Segregation also extended to the pedestrian bridges, Open Air Cinema, cemeteries, parks, pedestrian crossings, public toilets and taxi. The sexual contact and, of course, marriages between people of different races were prohibited. To be noted separately: the lack of daily communication opportunities estranged races more and more. As you can see, there is quite a lot in common between the time of apartheid in South Africa and the situation of the Roma minority in Ukraine today. Despite the absence of direct prohibition, the Roma mostly live in isolated reserves in extremely bad living conditions. They can also get only simple job, have limited access to decent education, poor health services, lack of the access to entertainment; marriages between Roma and Ukrainian are a rarity, they live in isolation and hardly communicate with other locals. Despite the fact, that, according to the law, Roma have no restrictions, in reality they are just as limited in their rights and freedoms, as they would be according to the legislation. The role of the law in the case of Ukrainian Roma is performed by the multi-difficult relationships, a significant difference in the life and traditions, mutual distrust. And, of course, by the inaction of the authorities. 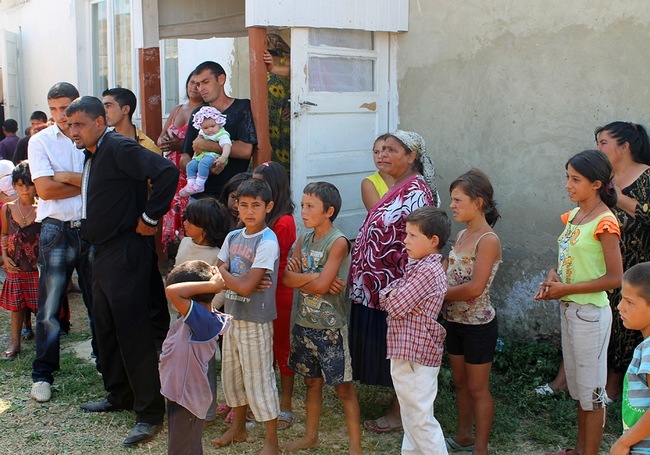 The main blame for the situation of the Roma minority in Ukraine is on power. The authorities, both central and especially local, should actively work on the integration of the Roma population into society. This problem is their “default” one, as they are the community’s representatives. In addition, Ukraine engaged to integrate the Roma population at the international level. Back in 2013, the Cabinet of Ministers of Ukraine issued a decree “On approval of the action plan to implement the strategy of protection and integration of the Roma minority into Ukrainian society for the period till 2020”. It described in detail the events that should have furthered integration. The strategy includes numerous measures in all directions and contains details about what certain authorities have to do in education, employment, health, social protection, improving living conditions, satisfaction of cultural and information needs and other aspects, for Roma to be actually closer to integration. The Strategy described in detail, which tasks the local governments have to perform. Unfortunately, as it often happens, in almost three years passed from the Strategy approval was practically nothing was done. Some achievements can be noted in health care, but there are still many shortcomings and faults. We understand, that in the same 2013 a revolution started in Ukraine, and next year the war began. Because of these events, Ukraine cannot recover so soon and in this situation the question of the Roma minority comes far away in the background. However, it should be noted that without these events, the Roma issue has always been somewhere on the margins, and officials prefer to not remember the Roma issues. But can be there really such problems in the state, which would put off people’s lives, the realization of their rights to the background? Does the state really see the problem, which is measured at 100,000 thousand Roma people? Or it can only adopt the Strategy with no implementation of its stated plans? In fact, stubborn inaction of the authorities, and putting obstacles for those, who really want to help the Roma community, means only one thing: for power, the situation that exists today is favorable. Officials are comfortable with the Roma community remaining isolated, ignorant dark mass, which is extremely easy to manage in their own interests. If human rights activists and Roma activists want to change something and are asking the authorities to assist the minimum or at least not interfere, they face dissatisfaction and hostility. For example, recently in Mukachevo Roma activists appealed to the City Council to allow them to create the self-government body. SGB is a form of government allowed by Ukrainian law that would allow members of the community, elected to the SGB to solve the problem of the territory covered by the SGB on their own, getting to appropriate funds from the city budget. In fact, the SGB were designed to make the life easier for local governments, because they no longer have to watch the works, which should be held in the territory, or care for roads and sidewalks, water supply and other domestic issues. The task of government is reduced to the allocation of the budget and control of its spending, and the organization of work is left for SGB. Experience in Europe shows that such cooperation of residents with the government has been very successful and mutually beneficial. Because power has less problems and citizens can invest money in what they need. It would seem to be a great outlet for Mukachevo City Council, which is constantly complaining about the problem of Roma. However, they categorically refused to create SGB. Moreover, the authorities have stated that this is a political body and some enemies had inspired Roma to create it… Instead they have promised that they themselves would take care of the Roma camp in Mukachevo; and, on the eve of elections in the autumn of 2015 they did “take care” – covered streets in the camp with gravel, through which the road level got higher than the Roma houses and all waste water (of course, there is no sewage deluge in the camp) rushed just to people in their housing. This reckless “help” of the city authorities have once again proved that they absolutely cannot imagine what improvement do Roma really need and they have simply thrown them a bone before the elections hoping that the grateful Roma will immediately vote for them. Is denying self-government for Roma, the authorities confirmed that they do not need intelligent Roma who can solve their problems. They need fools that will do everything for a kilo of buckwheat. Roma are denied the ability to independently solve their problems, shown that they are not capable of this and want to create a SGB only because someone subjected manipulate them: by means of all of these, Mukachevo officials have clearly demonstrated that the principle of segregation are very close to them. We again see the division of people into several sorts, “lower” of which can do nothing on earth and can only wait for “help” from the “higher” grades. Equally egregious case of segregation was the establishment of the monument for Roma in Mukachevo. This “cultural event” occurred on the elections eve and, obviously, was to be a pleasant surprise for Roma … instead, that turned into a scandal. The fact, that the Roma is portrayed as a janitor. The authors believe this profession characterizes the whole minority the best. This angered both Roma and human rights activists in Ukraine. Roma, who were historically known as excellent actors, singers, grooms, master a variety of crafts, do not understand why with all variety of images of Roma authors of the monument chose the simplest physical job that requires no special mental abilities or talent, or special skills. But the worst thing is, that this reaction … just surprised the authors and authority. Roma were of ingratitude and the community expressed complete misunderstanding of why they find the image of janitor abusive, although it is a fair and necessary profession. And thus, they perverted the discussion, as if not realizing that the protest was not against the occupation as such, but against the fact that Roma are associated with a very simple job only. From history we know what inevitably results in violation of the rights and freedoms of the population leads to a social revolt. In America, the reluctance of white citizens to recognize the equal rights of the dark-skinned people ended trough the activity of Martin Luther King and powerful disturbances throughout the country. To avoid large rebellion, the government was forced to make considerable concessions, change laws and regulations and acknowledge that all US citizens have absolutely equal rights. In South Africa the apartheid period ended with the collapse of the regime and the abolition of all discriminatory laws that kept the native population on the rights of the second grade. Often Segregation policy elite of the country led to bloody riots and revolutions. It is hardly appropriate to say that we might expect something like that. Roma are not characterized by aggressiveness. But in any case the continuation of discrimination will lead to further isolation of the Roma community. At the time, while in the Central Europe, in the countries next to Ukraine, a policy of integration of the Roma population in the society continues and they can already boast about some achievements; in our country the situation is only getting worse. The government chose the policy of inaction. Roma have to survive on their own, as they can, they are left to themselves and live as their ancestors did, they see no way out of their situation and have nobody to show it. However, the inaction does not fix the situation. On the contrary, the longer nothing is done about the Roma integration, the worse the situation becomes. The years of inaction have led to irreversible consequences. In the years since the collapse of the Soviet Union, all the gains of the Soviets integration of the Roma have been long lost and any new ones are not proposed. Society and government have convinced themselves that the problem of the Roma minority has no solutions. Some radical proposals are popular, even Nazi methods to solve problems, such as reservations, deportation of the Roma population, strict police control of them and so on. Fortunately, these proposals cannot go beyond the kitchen chats or the Internet posts. However, no one wants to see the alternative to radical policy. The authorities, aware of the negative public attitude towards the Roma, prefer to ignore the issue, or even support such attitude in the society. Although, as the best representatives of the community, they сould see further, aware that the situation can change dramatically and there is a need to make unpopular steps for improving the situation in the future. It can be stated, that no one has the political will for this. Meanwhile, to overcome segregation is real. Again, this is proved by historical experience. In countries, of which we have repeatedly mentioned in this article, the population exposed to discrimination because of their skin color, lived in the same conditions, on the same level as the Ukrainian Roma. The society hardly believed there in those years, that the population, which is exposed to discrimination, can live otherwise. The dark-skinned in the US or Bantu in South Africa were also treated dismissively, considered unworthy of living among white people and not smart enough to obtain a full education and get decent profession. “Roma do not want to live differently!” – This argument many consider as a crucial one. They say that changes cannot help someone who does not want to change. Actually, it’s a manipulative method for those who do not want any changes. The same way the village children once “would not” engage in anything other than work in the fields; simple people in towns “did not want” for their children a higher education, good living conditions and being fully fed, and the slaves “did not want” freedom. In the group, people are rather inert and it is really hard for them to accept change that is why they need those who can show them another way. In the case of the Roma, the attitude of society towards them must change first. If a bigger part of the population see Roma as the same people as they are, further integration will be inevitable. To overcome segregation regarding the Roma population, we must make some fairly simple but important things: to abandon the isolation of Roma camps, to provide adequate medical services, conducting regular educational work with the residents of the camps, refuse the separate Roma schools and kindergartens, to introduce programs of professional education and further employment of Roma, to give best Roma students an opportunity to get higher education, to help to improve Roma living conditions, monitor these processes, but not to punish, but to help correct mistakes and shortcomings. And most importantly – to work to change public opinion and break the stereotypes that existed about Roma. The big advantage is that we should not reinvent the wheel. All methods to overcome segregation and integration are developed and implemented. They work. Not perfect and not as fast as we would like. This process is really very long, since it requires changing the minds of many people. But most importantly, it works. The Roma issue in Ukraine is not unique. Similar problems arose and still arise in many places. Therefore, solutions were invented long time ago. Modern country, which, we believe, Ukraine is, must overcome negative degenerative phenomena, if it does not want to have it developed parallel with marginalized society. We are currently witnessing the situation, and if nothing is done to radically change it, sooner or later we get this time-bomb exploded.